Home » Home Fitness Equipment » What Does A Mini Exercise Bike Cost? What Does A Mini Exercise Bike Cost? The mini exercise bike can be purchased for as low as $18.95. This bike is designed to give people an opportunity to exercise in their office or in their home on a machine that is very small and compact. This exercise increases mobility in the joints and range of motion, helps builds strength and increases the blood circulation. This unique portable home exercise machine can be placed on a table and used to strengthen and tone arms and shoulders. Many people have found that exercising during the day keeps them more alert, increases mental functions and reduces fatigue. The Tube Frame Mini Exercise Bike for $18.95 is one of the least expensive units available. This has a simple tube frame and two petals. The petals come with straps to hold feet (or hands) in place and may have non-slip rubber footpads. These have a wide platform and a motion that can be jerky when started. It does not offer much resistance for a good workout but is great for gaining mobility and flexibility in the joints. Stamina Instride Mini Exercise Bike is a step up in the tube frame design for $39.50. It also has a wide platform, a digital timer, which measures speed and time, and a resistance knob that can be set to increase the pressure needed to turn the wheel making the legs work harder. For a good workout, the resistance levels are not here. This resistance mechanism does wear out over time and gets noisy. For the price, the Sunny Mini Cycle is a great buy at $50. It has better resistance and the display to record speed, distance and time. The resistance relaxes with use and needs to be reset; the narrow platform makes it shakier to pedal and it tends to jerk at higher resistance levels. The Magneciser Magnetic Mini Exercise Bike is one of the best at $129. This features a wider base and smooth, quiet operation. There is an adjustable magnetic resistance that works well and has a fully functional display of speed, time, distance and calories burned. To increase user satisfaction, this comes standard with a Velcro tether to keep it stable and in place on slippery floors. 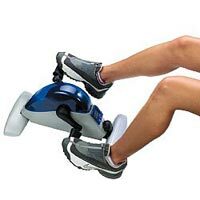 The mini exercise bike is a great investment at whatever price. It sits easily under a desk or table allowing the user to take advantage of any quiet time. This increases flexibility and mobility in the leg and arm joints and increases blood circulation keeping people healthier, more alert and able to complete their projects faster and with better results.